"Cityscape paintings are full of life. The variation of weather and how it interacts with the community and architecture tell rich stories. 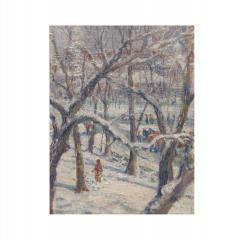 If you do not find a cityscape painting you are looking for, please call or email, we may not have cataloged it yet." Height 13.125" | Width 10.125"
Height 9.75" | Width 13"
Known for her pleasing cityscapes painted with vibrant colors, this painting is representative in these themes. 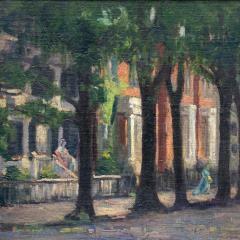 Likely a study for a larger composition, "Noon Street" bears all the hallmarks of her highly desired downtown compositions. 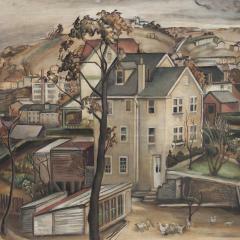 An exceptional composition of Manayunk, the considerable depth of this landscape both shifts the viewer eye throughout the composition while showing the transition of rural Manayunk into the more urban setting we know today. 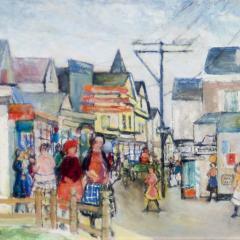 Wonderful painting of the Starbuck homes in Nantucket by Albery Lorey Groll.